As soon as you set foot on Sapa, you’ll be bombarded on all sides by trekking opportunities. So there’s no need to book a trek in advance because resources abound. Two months before arriving in Sapa, we were recommended a local guide by a Portuguese backpacker we met in Kampot. We followed her suggestion and called Mama Mae — the local Hmong guide she told us about. The booking process was simple: you can do it directly with the local guides as they approach you in the street, or by phone since they’ll hand out their numbers if you’re not ready to commit on the spot. You can also do it through your hotel, the Sapa tourism office or any tour operator around town. Then you’ll set up the day, time and spot where the trek starts. The payment is usually done at the end of the trek. Mama Bau: 14€ for one day trek and 28€ for 2 days + homestay. Mama Susu: 11,50€ for one day and 28€ for the 2 days + homestay. If you’re an experienced hiker you could do the trek on your own, but by hiring an experienced guide you’ll be helping the local communities and learning about them. Besides, no one knows the hillside as they do. Nuno and I met Mama Mae at 9 in the morning, near the Gothic church in the city center. 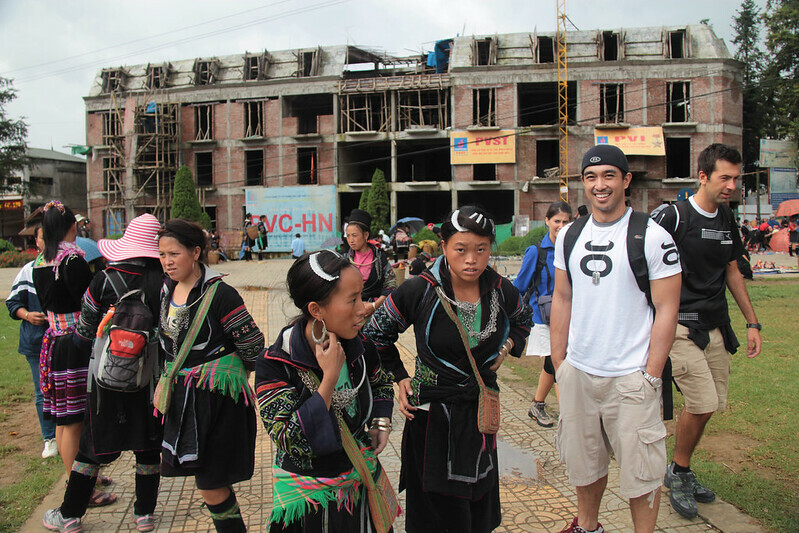 The two of us joined a group of four American girls and three other Hmong women that walked alongside us the entire trek. Mama Mae spoke very good English but the other Hmong women did not. We figured that they must accompany tourists as a way to practice their English, so eventually, they can become guides themselves. It was a beautiful warm and sunny day in opposition to the stormy days before. We were super excited to be out and about exploring nature, and having a genuine taste of the Vietnamese rural life. However, two hours in, we realized that 1,5L water bottle wouldn’t last long for two grown men hiking a mountain and descending through muddy rice terraces. Not to mention that Mama Mae got thirsty too, so we ended up sharing our water with her—because we’re gentlemen. Take plenty of water, you’ll need it. There aren’t any shops in the hills, only in the villages. The scenery was breathtaking—everywhere we looked was like a panoramic screensaver! Not only Mama Mae took us to the best lookout spots in the mountains, but we also saw water buffaloes, piglets, tea and cannabis plantations. We talked for hours about Vietnam, her family and ours. She was like an open book. At noon, we stopped for lunch at a humble restaurant where other hikers were. Mama Mae provided us with a noodle soup and some pieces of fruit, but the drinks we paid ourselves. After lunch, we walked a few more hours to her house, where the first day of trekking ended. We met the husband and granddaughters as she prepared some tea for us: Lipton, believe it or not. After tea, she explained how she makes indigo blue dye from plants. The other 3 Hmong women that followed us around came with a goal in mind: to sell. To sell as much as possible. After a subtle sign from Mama Mae, they pulled out all sorts of knick-knacks from their wicker baskets: bracelets, wallets, shawls, and whistles, along with an aggressive selling tactic. They turned into unfazed vending machines that didn’t take “no” for an answer. Having finished our full day trek, Mama Mae took us to the center of her village, calling two motorbike taxis to take us back to Sapa: 2.00€ each, paid by ourselves. The ride back to Sapa alone was amazing. It’s not every day that someone can ride through valleys in Vietnam, with the sun setting behind the mountains and the last sunbeams reflecting on the rice paddies. That’s something we’ll never forget. Keep it light and simple. All you’ll need is a comfortable pair of sturdy shoes, light clothing, and a camera. Remember to take plenty of water, snacks, sunblock and you’ll be good to go. As a side note, Sapa has plenty of shops that both rent and sell trekking gear. If you’re planning a trekking tour on Sapa we still have Mama Mae’s, Mama Bau’s and Mama Susu’s phone numbers and will gladly share them with you. Leave a reply down here or at any of our social media outlets and we’ll send it to you via email or PM. Here’s a photo of Mama Mae taken in September 2018 by Cristelle — one of our readers. Cristelle reached out to us and asked for Mama Mae’s phone number. Two days later she was trekking with her in Sapa! We’re super glad to contribute (even if in a small way) to your adventures, and by doing so, unintentionally helping Mama Mae on the other side of the world. I really liked your Sapa article – very authentic. Could you please share the contact info of the three guides. I will be in Sara in one week. Check your email inbox for the contacts. Enjoy your time in Sapa! Stay in touch. Hello! 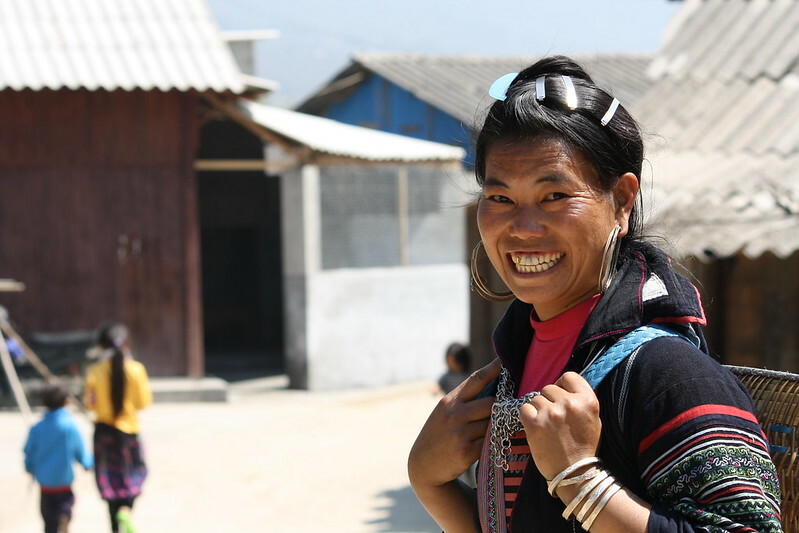 We’re heading to Sapa in a week or so and would love the numbers of any of the Mamas from your article – thanks so much! Hope we’re not too late. Have a great trip! Hey! Going to Sapa on April. Could you send the contacts of the three mama’s you mentioned above? Also, would you recommend getting to Sapa by bus or train? We got to Sapa by bus because it was the easiest and fastest way. So considering that the trip went fine – and being the only reference we have – we would recommend the bus. Hi! Wonderful article on Sapa, and its guides; a very informative write up! Kudos!! Would appreciate if u can share the 3 guides contact no. Thanks for the feedback Joe. We really appreciate it! Thank you for all those tips, there are very useful 🙂 we are going to SaPa this weekend, i know its a bit under short notice but could you please share the contacts of the three Mama’s you mentioned above? Thanks for your feedback and have a great weekend! Sure can. Check your email inbox for the phone number. Hi! We might be doing this in January! Can you give me the contact info? Thanks! Hi! You’re the Justin we talked with on Instagram, right? Hi! Glad I found your blog. I’m going to Sa Pa this coming January. Looking forward for trekking experience around Sa Pa. Hope you can share the contact numbers of the guides. Trekking in Sapa is going to be a great way to start your year. Have a great trip (and a great 2019)!